SOTA Mt Rob Roy VK1/AC-031 - 3/3 summit challenge - Are my legs still there???? After the initial tortuously steep climb out of the suburbs, bursting into the morning sunshine before entering the Rob Roy Nature Park was a very pleasant surprise - i suspect the sleeping locals (above) were not impressed with my intrusion. Rob Roy was the 3rd of the 3 summits I had challenged myself to complete by the end of the Easter long weekend. Each increasingly more challenging in height and approach as the last. The actual summit is off the track however the entry to the foot trodden bush track is marked by a mini carn (below) . Mt Rob Roy's trig point is unusual, I have not seen one like this before. 3 metal support arms with a wooden upright indication. Which makes for a good squid pole support!! Summit number 2 of 3 this weekend, I shall remember Bullen Ridge for 2 things - its gates (5) and the BIG Buck Deer that snuck on on me in the AZ while I was setting up. This summit also saw my first DX stations on my own gear on 5w - 2 ZL stations. I set myself the challenge of knocking over 3 summits over during the easter long weekend - and they are all more challenging than my others to date. The Mt Mundoonan Summit is exactly 50km North of GPO Canberra city, just to the east of Yass NSW. It was an absolute smashing day, no wind and with early low lying cloud - the summits was above them! A great day on the radio, knocking over my 1st NSW summit along with my 1st of my weekend 3. SOTA and Mental Health - how it's helping. I mentioned in one of my more recent SOTA videos that I was going to write about how SOTA was helping me fight depression and anxiety. I understand that some might consider it a long bow or even not get it entirely. Before I get into the how or why it is helping, lets get some definitions at least as they relate to my brands of anxiety and depression. In basic terms, Anxiety is the miss-timed or miss-activation of the fight of flight response. Faced with a bear? Flight or flight is normal, having an heart racing, mind running at a million miles an hour and feeling out of breath, having that repeating thought that some one is out to ‘get’ you in the middle of the supermarket? Thats my anxiety. Supermarket, car, work, laying in bed, it springs up on me . You know that thing you love? Being outdoors? Being with friends? Fishing? Building things? Exercising? You know that feeling you get even thinking or planning to do that? Yeah for me depressions is the colour sucked out of life, I simply do not get the same buzz from things that I know I love and enjoy. Some people see that as ‘Wade is just being lazy’ - I can tell you I WANT to do things, but my brain is all like “why bother”. OK so those out of the way. Think mental health is just a ‘mental’ thing? Yeah tell that to the 10kgs that joined me this year since diagnosis because the normal active things I like have no ‘colour’ to them. 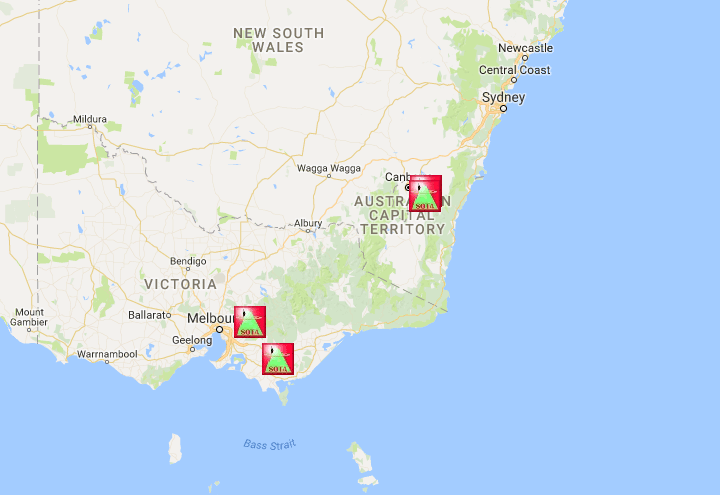 I recently obtained my Australian Amateur Radio License (Feb 2017) and since completing it, I discovered this section of the hobby that combines elements I really enjoy. Being outdoors, learning new skills and tinkering with different set ups. And it is making the depression and anxiety disappear - at least for the day I am outdoors! There are designated mountain / hill summits world wide, in the ACT there are currently 48. They are assigned a rating based on height and difficulty, with some earning a bonus 3 points in winter due to possible snow. The aim of SOTA is to make 4 contacts (voice or morse code) from the summit to consider it ‘activated”. A station / operator on the summit is the activator, the home station is called a chaser. Summit to summits contacts between 2 ‘activators’ are a real bonus with points shared. Every weekend (apart 1) since I have been licensed I have been out activating a summit. This involves selecting a summit, planning or researching a route, packing gear, planning the activation, recording video and photos to share with you. How is it helping? Well many MH professionals suggest being outdoors and doing physical activities along with having goals that are achievable - guess what ticks all those boxes?? SOTA it is. Also side note have lost between 3-4kgs lighter! I keep saying it, another weekend and another summit! The VK summer is definitely coming to an end, the weather is Canberra has started its usual turn for the worse in April. That being said yesterday it was a rather glorious day on the summit of Mt Taylor, VK1/AC-037 one of the tallest summits located within the ACT residential area at 850m ASL. Taking Andrew (VK1AD)'s advice I stayed clear of the trig point as it gets VERY busy with walkers of all descriptions. This gave me a chance to test out not only my new 7m squid pole which was much lighter than my 10m one but, also my DIY free standing guying system. Up until now, I had always had the trig or another structure to strap the squidpole to. Another HUGE (by my standard) day with the summit qualified on HF 40m in under 5 mins! 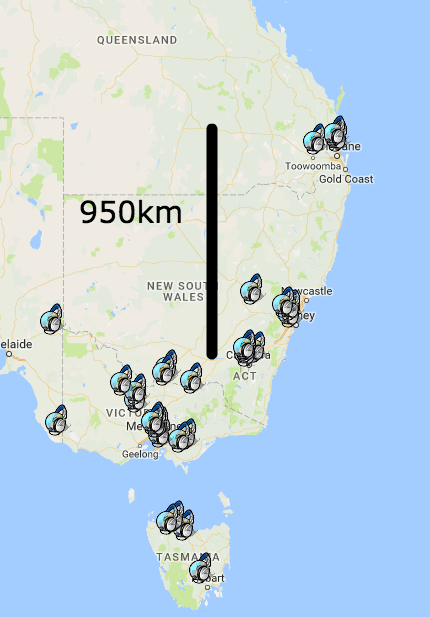 Longest distance was over 950km just north of Brisbane (VK4). I had not looked much into the WWFF or Parks program however the last 2 summits were also in parks. My (limited) understanding is 44 contacts are needed to activate the park over a UTC year, I managed to activate both parks in 1 sitting each! 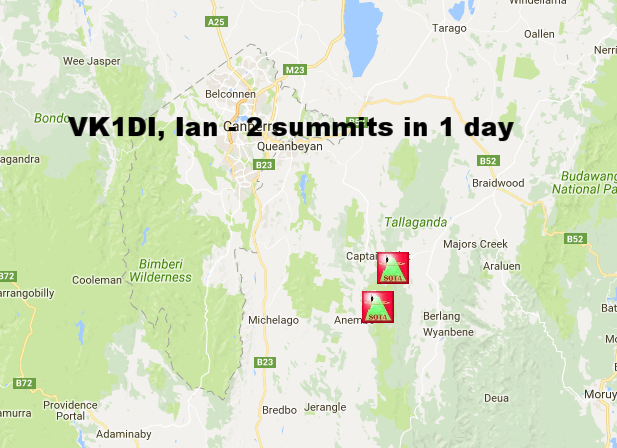 Working VK1DI, Ian on 2 summits in one day! I had been looking for a super lightweight guying system. 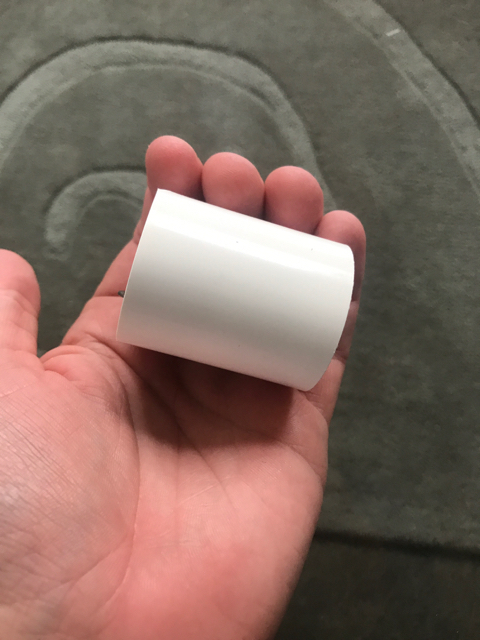 I had seen some operators using 3D printed collars etc, but as I was building it on a Friday prior to a Saturday activation (I am a bad planner) to a trip to the local hardware was in order. I managed to put together a system using a plumbing collar and 3 stainless steel wire key ring loops. How did it work? PERFECTLY. It sits about 3m up so gives a good stability point. Hope you enjoy, look forward to hearing you on the air. I thought I would share the gear I use on the summit activations. Far from being a joke, 1 April went down pretty awesome on Tuggerong Hill AC-038. 1 - 2 April is also AM weekend, I had never made a contact on AM. A number of chasers didn't see the note on the AM mode to being able to pick when a chaser is on SSB was also a new skill. NB I have only had my license for 7-8 weeks. I have managed now 7 summits, even if 1 pointers. After a solid 4 hours working the band I managed a phenomenal 44 contacts and 9 or more contacts S2S. SOTA: Activating Mt McDonald VK1/AC-048 - including a Snake! Turning around right on the heels of Activating Mt Majura yesterday, I thought I would give Mt McDonald a try. This trail was a different type to Mt Majura with less shade. I am also learning that I am hitting the trail as well as the airwaves too late in the day - noon local. Not only from a safety perspective but from a band conditions point of view. This activation was a "just get it done" one for me. It was hot, dry and exposed. I only made 1 HF contact this trip. But 4 contacts is 4 contacts! On the way back I even came across a small snake crossing the path. I think it was an Inland Taipan. Nothing to worry about, only the worlds' number 1 snake. This was my first 'real' SOTA activation, where I walked up Mt Majura and operated my radio and made SOTA contacts. 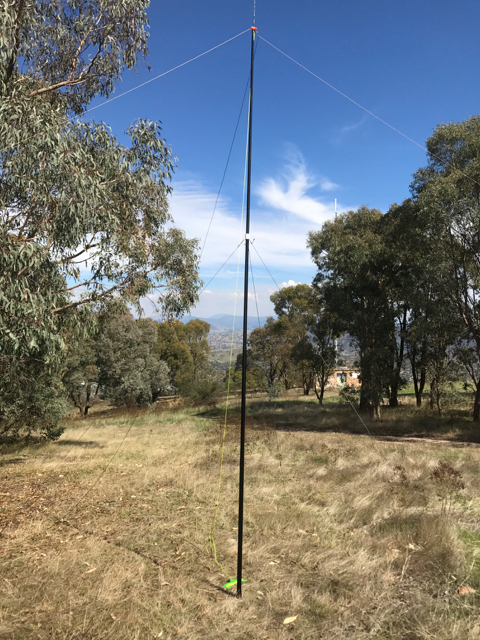 This was my single most successful day operating my radio as well as my longest range VK (Australia) contact to VK7CW in North Tasmania - 700kms, and my first summit to summit contacts - 400kms all on 5 Watts. It was a warm day in Canberra and the operating position is right next to the Canberra Airport as well as a shooting range is below which made for interesting exchanges on the radio..